The Dwight D. Eisenhower National System of Interstate and Defense Highways, which is popularly referred as the Interstate Highway System, is a part of the National Highway System of the United States. The system is named after the 34th President of the United States, Dwight D. Eisenhower, who promoted the Interstate Highway System. Formed on June 29, 1956, the Interstate Highway System covers a length of 47,856 miles. The Interstate Highway System connects the 48 contiguous states of the country. Alaska and Hawaii and the unincorporated territory of Puerto Rico also have interstate highways. 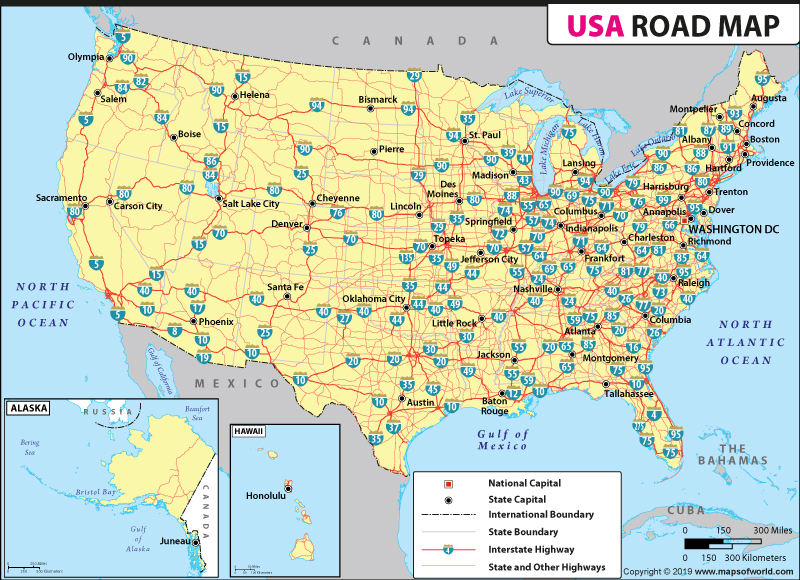 US Interstate Map shows national capital, state capitals and highway numbers along with extensive road and highway networks. travel, the US Highway and Interstate System has become a necessity for all Americans. Not only does the network of highways provides a quick and convenient means of transport across the country, but also gives an opportunity for adventurous road trips. Stretching for 3,020 miles, Interstate 90 (I-90) is the longest interstate highway, and here's why you need to take a trip along this amazing road. I-90 snakes its way across thirteen states, from Boston, Massachusetts in the East Coast to Seattle, Washington in the West Coast. With such connectivity, this is undoubtedly the perfect route to set up your chain of convenience stores or simply enjoy the American scenery end-to-end. Some of the major cities along I-90 include Chicago, Cleveland, Albany, Buffalo, and Boston, while smaller cities include Sioux Falls, Butte, Erie, Syracuse, and Sheridan, among many others that dot the highway's length. Apart from miles of mind-numbing highway, the I-90 is a driver's delight, full of attractions along the way. Some of the most famous attractions that drivers enjoy along I-90 include the Wall Drug Stores, with Buffalo Gap National Grassland, Corn Palace and Framboise Island thrown into the mix. Traveling the I-90 for two weeks of your holiday is certainly a great idea, and you may also enjoy the historical tidbits along the way. Lower speed limits are experienced in Northeastern states, while speed limits are higher in Southern and Western states. While the maximum speed limit in northern Maine is 75 mph (120 km/h), it lowers to 50 mph (80 km/h) in New York City. So if you want a grand tour of the northern states, grab a copy of the US Interstate Highway map and get ready to enjoy miles of American landscape.